Join us in our commitment to turn childhood dreams into reality by supporting THONTM. Together, Julie Turano and Peter Spiridigliozzi, are taking action by uniting with 16,500 student volunteers and over 25,000 alumni supporters in the fight against childhood cancer. Our year-long efforts culminate in a 46-hour, no-sitting, no-sleeping dance marathon each February to celebrate our survivors, remember those we’ve lost, and take a stand--all in hopes of one day dancing in celebration of a cure. In 2015, Peter joined Lambda Chi Alpha and Julie joined Alpha Sigma Alpha. These two organizations made up a powerhouse fundraising team, responsible for raising over $220,000 consistently every year in an effort to fight pediatric cancer. We served our organizations faithfully for several years participating in weekly canvassing, annual mailing campaigns, multiple canning trips, and numerous alternative fundraisers. Unfortunately, as of this year, Alpha Sigma Alpha is unable to participate in THON, but we were not going to let anything get in the way of a cause we are so passionate about. In order to continue our dedicated fight against pediatric cancer we have decided to take part as an Independent Dance Couple. Independent dancers are dedicated individuals who set up their own fundraisers throughout the year. With your contribution, you will bring us one step closer to being able the take a stand against childhood cancer during THON Weekend 2019. We will be able to have the opportunity to stand and dance for those who can’t and next to the families we have been fighting for all of these years. Ever since we started dating two years ago it has been our dream to get out of the stands and to spend 46 hours on the floor together. THON has been a passion that we have both been drawn to. Over the past few years volunteering alongside one another, we always pushed each other to never lose sight of our mission. Though we are graduating we look forward to contributing to the fight against pediatric cancer after college. 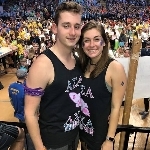 Peter plans to continue a lifetime of giving and volunteering in support of this cause and Julie will be going to Physician Assistant school to work in pediatric oncology. We are so excited to start the THON 2019 year. Although, at times it can be challenging, we never lost sight of what we are doing it for. We THON for the fight, for the cure and for the kids. Over the next year, we hope that you will join us in supporting this cause!